Had I not cheated, nor gone out on Monday and Tuesday nights, we would be completing the Paul McCartney collection rather than starting it, but I have no regrets. I didn’t realize I was such a McCartney fan until I noticed I had three of his solo and/or Wings albums and only one album from another Beatle, even though that was the Concert for Bangladesh triple record set from George Harrison. I loved all the Beatles, of course, but Paul wasn’t my favorite. George was. But, the more I have learned about the Beatles in recent days and years, the more I like Paul McCartney as a person. As we have more Paul coming, I’ll address my reasons later. This solo album includes the extraordinary “Maybe I’m Amazed,” of which we already heard Rod Stewart sing a live version when we were on the Faces. It’s a song that any woman would want her man to write for her. 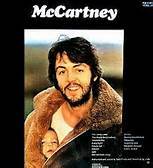 It is said that Paul wrote it for his wife Linda for helping him get through the break-up of the Beatles. Of course there is a song called “Lovely Linda.” It’s the first song on the album. As I continue to listen, I realized the whole album is an ode to her. It’s like Paul’s Layla (please refer back to Derek and the Dominos), only while Eric Clapton was obsessing over a woman he couldn’t have (yet), Paul wrote for the woman he did have. Think that maybe the title of the album – McCartney – referred to her, and not him? Or their union. Aww. Poor Linda was accused of being instrumental in the Beatle break-up, though not as much as Yoko Ono. I never blamed Linda, nor Yoko, however, as much as I feel Yoko got a raw deal from the public, I still don’t like her, and not just because her music stinks. But this is about Paul McCartney and his first solo album, which has just provided me with a quite decent workout. It just seems that Paul wanted to experiment with words and music and have a good time doing it, while learning to write on his own.